Ser Kevan is Lord Tywin’s younger brother, the only one to survive, and his trusted counselor. He is portly and balding, with a yellow beard along his massive jaw. 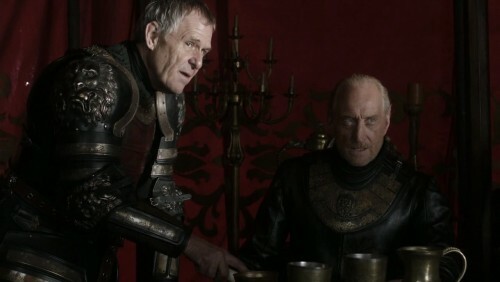 He has three sons, among them the king’s squire Lancel, and a daughter with his wife, Lady Dorna of House Swyft. He is perhaps in his late 40s or early 50s. The actor cast in the role is not portly, nor is he naturally bond. He is also somewhat older than the character as described.